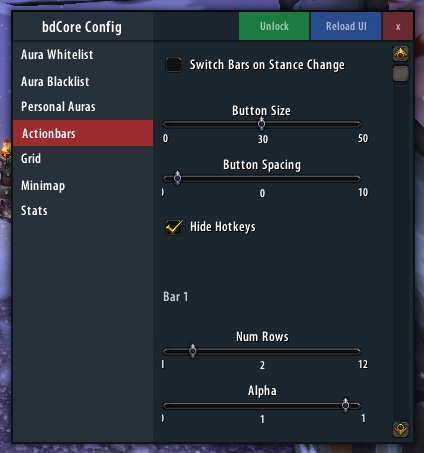 bdActionbars are a action bar replacement. bdActionbars are a lightweight, functional, and customizable replacement to the default UI. Added option for reducing the # of button on a bar. It says updated on wowinterface but no update to 8 as of yet is there any plans on doing that? Really love the addon. Very leight and clean. However, it would be an awesome feature if we could for example, resize Bar1, w/o the other Bar's being resized. I also cannot have a bar with only 2 buttons, which limits the costumization. The Addon is still really good, and has been my main UI for a good time now. Hope to see more updates in the future! Since Patch 7.2 there is a strange Frame when the petbar is active. edit. Solved the issue, just added the following lines in the petbar.lua on the end. Last edited by MetzgersWitwe : 04-12-17 at 08:27 AM. Have v1.3 from 3/31/17 and can not right click use any buttons. Get some "action reserved for Blizz" error. Just FYI, when you get some time. I think I am missing the Vehicle button. I would guess it is the one needed to exit or drop off to nearest flypoint. Anyone know if there is a way to reset it or enable it in some options? This has to be the best replacement for actionbars i uses. Any way to fix this my self? Why is action bar 1 slightly bigger than 2 & 3? Hell, I think even 2 & 3 are slightly different sizes. Makes it pointless to have 1 button size slider when they're all different anyway... I'd rather a size slider for each bar separately in that case. Does Masque work with this addon? Any way to reduce change the number of buttons on each bar? If not above 12 at least lower so you can combine 2 bars into one that has 12+. I'm not sure if you maintain this addon, but please check your pm's regarding it from me. 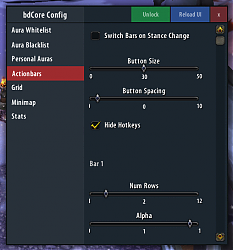 Hi,lovely addon but i want the it to show border around the buttons if u spam a spell like default blizzard actionbars and bartender etc etc,with the skinning your having on your actionbars!! Hope you understand what i mean!